After spending two years in bed with Lyme disease, Steven Kotler had lost everything: his health, his job, his girl, and, he was beginning to suspect, his mind. Kotler, not a religious man, suddenly found himself drawn to the sport of surfing as if it were the cornerstone of a new faith. Why, he wondered, when there was nothing left to believe in, could he begin to believe in something as unlikely as surfing? What was belief anyway? How did it work in the body, the brain, our culture, and human history? With the help of everyone from rebel surfers to rocket scientists, Kotler undertakes a three-year globetrotting quest. 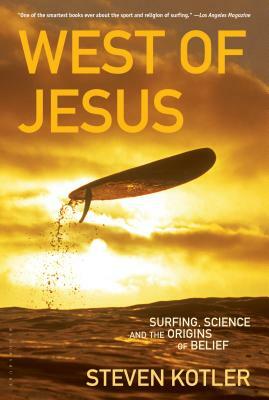 The results are a startling mix of big waves and bigger ideas: a surfer's journey into the biological underpinnings of belief itself. Steven Kotler's novel The Angle Quickest for Flight was a San Francisco Chronicle bestseller and won the William L. Crawford IAFA Fantasy Award. His nonfiction has appeared in the New York Times Magazine, GQ, Discover, Outside, Details, Wired, Men's Journal, and elsewhere. He lives in Los Angeles. STEVEN KOTLER is a New York Times bestselling author, award-winning journalist, and co-founder and director of research for the Flow Genome Project. His books include Stealing Fire, The Rise of Superman, West of Jesus, andA Small Furry Prayer. His work has been translated into over 40 languages and appeared in over 100 publications, including the New York Times Magazine, Wall Street Journal, TIME, Wired, Atlantic Monthly, andForbes.